I can't believe it's been a year since I became a part of the very first Project Life Creative Team, but alas, my time is up and it's time to pass the torch on to the 2013 team, which will be announced on Becky's blog next week. I have had a lot of fun this year working with Becky and her team, and I will really miss interacting with them on a regular basis. In my last "official" act as a creative team member, here are a couple of recent layouts from the end of September/early October. Although I have a little bit of catching up to do for 2012, I am already thinking about my plans for 2013. I am considering doing an all digital Project Life album next year and finally tackling baby books for all three of my girls with the new Project Life Baby Editions that should be available on Amazon THIS WEEK. I may not post my layouts quite as often, but rest assured I will still be busy over here documenting life. And in all sincerity, thank you for letting me share my Project Life pages with you during this past year. Before the holidays hit in full force (I can't believe Thanksgiving is already next week... missing a whole week of school/life because of Hurricane Sandy has thrown me completely off! ), how about a couple of Project Life layouts leftover from the summer? I thought I would use these pictures to point out a few products and techniques I have found myself using a lot lately in addition to the core Project Life products. I really love the banners that Ali Edwards creates for various seasons and holidays. The "Hello Beach" banner above comes from her Beach Outline set. You can also find sets for Halloween, Thanksgiving and Christmas. On the photo above, I used Cathy Zielske's technique of screening back text over a photo (see video tutorial here). Ever since she posted this tutorial back at the beginning of the summer, I have been using this technique a lot. I used these State Love journaling cards for the second half of our trip to Oregon, and I really love how they stand out on the page. My only complaint is that when you open the files in Photoshop, the heart isn't on a separate layer so it takes a few extra steps if you want to move it so that it's over a specific city. It is doable without too much effort though, and there is actually a tutorial here that shows you how. And of course, one of my all time favorite products... Cathy Zielske's Tiny Templates. I mention them a lot, but I'm pretty sure I use them at least once in every Project Life layout I do! Congratulations Samantha! I'll be in touch to let you know how to claim your prize. For the rest of you, I have a small something to share. If you watched my webinar last week, you heard about how I use a template to sketch out my weekly Project Life layouts. I know there are a few other great templates out there, but I thought I'd also offer up my personal template for anybody who'd like to use it. It has room to sketch out two full Project Life layouts (I usually just fold it in half and work on one week at a time). If you'd like to download it, just click the link below! Project Life is turning three this week, and today I'm thrilled to have the chance to participate in the festivities along with the rest of the Project Life Creative Team. I talk about Project Life a lot, but that's because it's been truly revolutionary for me. As I have said before, I finally feel like I have a way to record my story in a way that is both manageable (read: simple) and also meaningful. Aside from the Project Life Core Kits + big pack of page protectors, these are the products I find myself using the most in my albums. 1. First of all, since these products will be shipped directly from Amazon, the winner must be a U.S. resident. I'm really sorry, I know this is a bummer to all the international readers out there. 2. To enter, leave a comment on this post. 3. I will close the comments at 9pm Eastern time on Sunday, October 7th and select a winner. Good luck to everyone, and happy birthday to Becky Higgins LLC and Project Life! Congratulations Brianne! I'll be in touch to let you know how to claim your prize. Thanks to Becky Higgins and Big Picture Classes for sponsoring this giveaway! If you didn't win, you can still register for Project Real Life through October 10th. Class starts on October 4th. I hope to see you all there! Project Life: Project Real Life Giveaway! There has been so much exciting Project Life news over the past month or so. Becky introduced the new Project Life designs for 2013 (Seafoam & Olive) and debuted the amazing new Childhood Editions. But what I was personally most excited about was the announcement of the new Baby Editions. Did you know none of my girls has a baby book? Ella does have an album with a collection of various digital scrapbook pages I completed when she was little, but it is not a full picture of her babyhood by any means. Still, Claire sees it and asks why she doesn't have one too. Needless to say, I plan to order the Project Life Baby Edition x 3 and knock those baby books out! As if all that wasn't enough, Becky Higgins herself will be teaching a comprehensive 12-week workshop over at Big Picture Classes called Project Real Life. You can read all about it in the class description, and Becky also posted a great Q&A on her blog if you want more details. It sounds like it will be a great class for everyone - new Project Life users, seasoned Project Life users, or even someone who has never even scrapbooked before. I am really excited to take this class and I hope some of you out there will join me too. 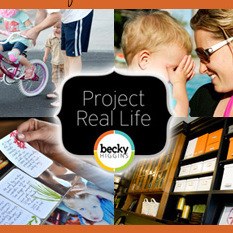 In fact, Becky Higgins and Big Picture Classes have given me a spot in Project Real Life to give away to one of you. If you want to enter to win, leave a comment on this post. I will close the comments at 9pm Eastern time on Wednesday, September 19th and select a winner then. And now, a couple of Project Life layouts from earlier this summer. I think last time I posted about Project Life I told you I was all caught up? Well don't worry, our end of summer vacation threw me off and now I am way behind. I'm sure I'll catch up again... eventually. You can't see it too clearly (I should have taken a close-up), but in the top left photo on this page I scanned in a note that Ella wrote to her first grade teacher and incorporated the scan onto the photo using one of Cathy Zielske's Tiny Templates. I really like how it turned out, and I especially like the fact that I didn't have to include the entire piece of paper she wrote on in the album. I am all about trying to streamline extra inserts this year. Here is Week #25, the week of Father's Day. I included the drawings Ella & Claire made for Matt as inserts as well as the card Ella brought home from school. Congratulations Cindy! I'll be in touch to let you know how to claim your prize. Thanks to Becky Higgins for sponsoring this giveaway! Before I get to the giveaway, I wanted to share a little something for anybody who has ever come here and asked themselves "What in the world is Project Life?!" Take a look at this quick video - it's literally just over a minute long - that explains in really simple terms what Project Life is all about. And now for the fun part. If you are familiar with Project Life, you will know that a whole bunch of new page protector and photo pocket page designs were just released (If you want more details on any of the new products, check out Becky's detailed post on her blog). 1. Since these products will be shipped directly from Amazon, the winner must be a U.S. resident. 3. I will close the comments at 9pm Eastern time on Tuesday, August 14th and select a winner then. Before I go, here are a few Project Life pages that I haven't shared before. I am actually surprisingly caught up even though summer is the time I tend to start falling behind. I have my album up to date through the first two weeks of July, but I haven't had a chance to photograph those pages yet.